Go from idea to performance in an instant and build layered masterpieces with ease. One knob, two buttons – it couldn’t be simpler! 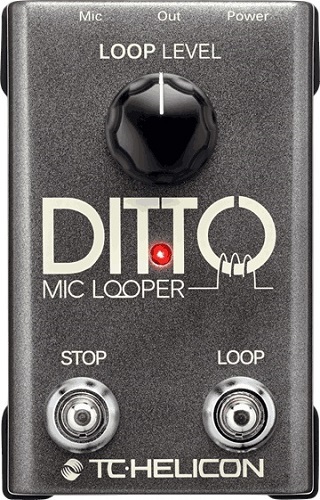 With its superior audio quality, unlimited overdubs and Undo/Redo, the Ditto Mic Looper from TC Helicon is the essential choice for looping mic’ed instruments and vocals. Intelligent Mic Input Gain for Quick and Painless Setup. Built In Mic Control, Infinite Overdubs and Loop Storage. Intuitive LED Indicator for Modes; Dedicated Loop Switches. Quiet Mic Preamp with Phantom Power, Balanced XLR Out, Power & USB for Updates.